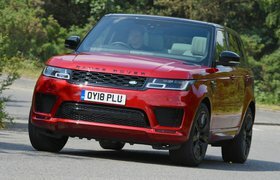 2018 Range Rover Sport PHEV P400e review - price, specs and release date | What Car? Water and electricity: two things that mix about as agreeably as Arthur Scargill and Margaret Thatcher would on a gloomy weekend in Merthyr Tydfil. 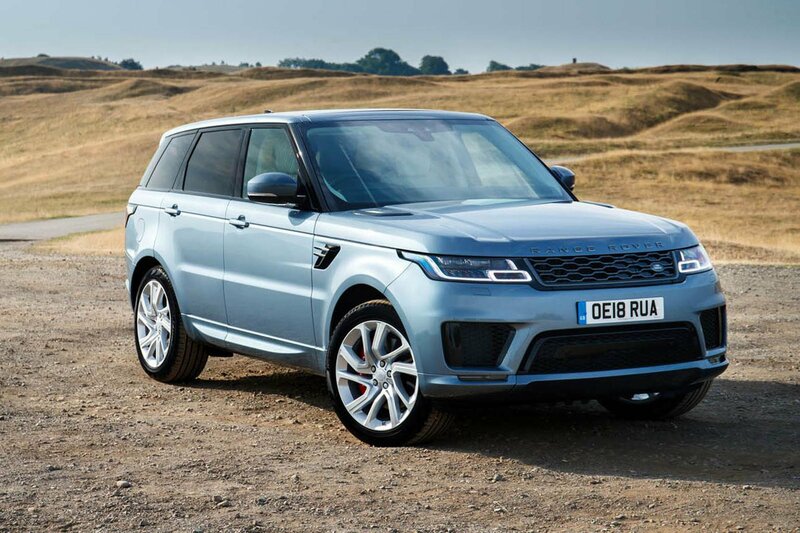 Considering, then, that the Range Rover Sport is purportedly capable of traversing all things moist, from a boggy paddock to a small river, this new plug-in hybrid P400e version of it might seem a little incongruous. Yet in reality, it makes perfect sense. Of course, Land Rover has sealed the batteries out of harm's way, from where they can power the P400e’s 114bhp electric motor up to a claimed 31 miles of electric-only range (although that's more like 20 miles in the real world). So, what you’re looking at is potentially cheap motoring, should you happen to be one of those Range Rover owners who makes mainly short trips within a 10-mile radius of, say, the King’s Road. In which case, you’ll hardly ever need to fire up the 296bhp 2.0-litre petrol engine. And it will keep happy the misguided anti-diesel lobby, some of whom may well set future government policy. To them, driving a diesel is like injecting your children with a mix of cholera and the Black Death, while owning a hybrid is seen as akin to serving them fresh kiwi and rose petal smoothies for breakfast, lunch and dinner. The truth, as always, lies somewhere in between such extremes. However, if you buy a P400e instead of a SDV6, you definitely won’t wake up one day and find yourself on the wrong side of a potentially punitive diesel tax, should such a thing come into force. And what’s certain is that with official CO2 emissions of just 64g/km for this 2018 model year (tested under the old NEDC test), the P400e will cost you just 16% benefit-in-kind tax (BIK) as a company car, and you’ll be exempt from London's Congestion Charge. To be completely clear: 2019 model year cars, which are available to order today, have been tested under the stricter WLTP efficiency rules, pushing CO2 emissions up to 73g/km but keeping the BIK rate at 16%. Happy days, then, but is the P400e a better hybrid luxury SUV than the Audi Q7 e-tron or Volvo XC90 T8? The most notable difference between the P400e and the 3.0-litre diesel is the pervasive silence that replaces the background mechanical rumble at idle. With battery charge available, that serenity continues on the move, too, if you’re just pottering along with a light foot in Comfort or Eco mode or have EV mode selected, in which case the petrol engine will be banished all the way up to 85mph. That quietness is one of the unerring joys of electrified car ownership. Another is the initial hit of torque you get from the get-go, enabling you to pull out from a side turning on to a main road with complete confidence that you won't be left floundering. That said, the initial take-up in the P400e is almost too savage, so you need to squeeze the throttle prudently to get it off the line smoothly – at least until you get used to it. The P400e is pokey enough in electric mode, certainly for driving around town, and if you put your foot down to awaken the petrol engine (which emits a noticeable yet perfectly palatable four-cylinder rasp and turbo whoosh under hurried acceleration), you get the full gamut of 'go'. Well, after a second or so, that is, because there’s a noticeable delay as the software activates the hardware – engine, gearbox and electric motor – and it all synchronises before sending you on your way. The pace is plenty for most people (0-60mph takes 6.3sec), although it's not quite on terms with the XC90 T8's. In higher gears there’s also a lack of mid-range shove compared with a diesel, so you might be better off with the SDV6 if you regularly tow a large caravan or horsebox. Often, the big challenge with hybrids is getting all the motive forces to integrate and switch seamlessly from engine to motor and back again without you noticing. Much of the time in the P400e, those transitions go unnoticed, but there are certainly occasions when you feel a jolt, maybe combined with the odd clunk from somewhere deep within the car, that gives the game away. In this respect, the Q7 e-tron and XC90 T8 feel slightly better integrated. The P400e isn't as refined as the Q7 e-tron in other respects, either, but that’s not to say it's coarse: its brakes can grab slightly, but not overtly like some hybrids', and wind noise is still relatively well suppressed at speed. There’s definitely more road noise on the motorway than you hear in the Q7 e-tron, but that’s partly down to the huge 21in wheels fitted to our top-spec Autobiography Dynamic test model. Also the ride isn't as wafty as the Q7 e-tron’s, but again, some of the additional fidget over patchy town roads or the thudding across ridges at speed will be down to those vast alloys. It doesn’t feel considerably harsher than a regular Sport shod with similar rubber, and, as always, we’d recommend sticking with the smallest rims possible if you want the best ride. Despite being around 300kg heavier than other Range Rover Sports, the P400e still corners tidily for a tall car weighing in at just over 2.5 tonnes. Its steering feels linear, body roll through turns remains relatively well checked and there’s lots of grip. 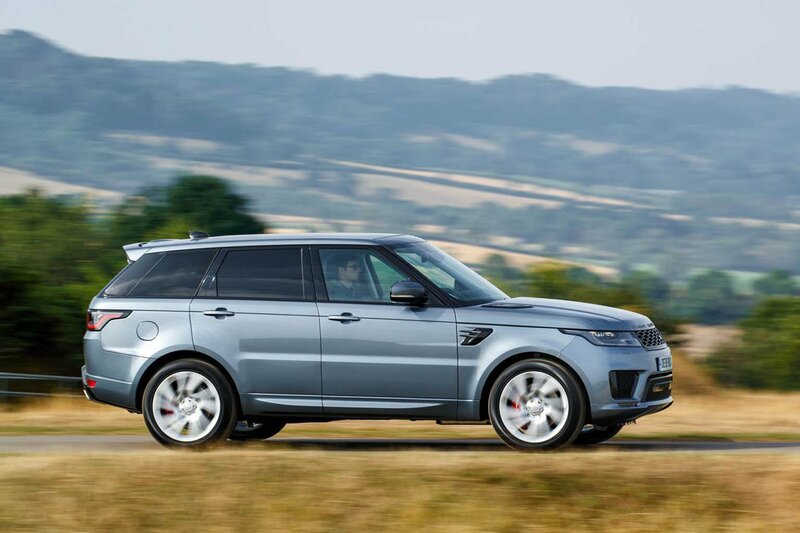 And being a Land Rover means it has all the usual off-road driving modes, giving you the capability to keep going where other hybrids might flounder. Like in rival SUVs, there’s something distinctly imperial about sitting in the supportive captain’s chair on the deck of a Range Rover Sport, looking out at the sea of ‘regular’ hatchbacks and lorries below you. Okay, maybe lorries is stretching the poetic licence, but you get our drift. What separates the Sport from the Q7 and XC90 is the feeling of being more cocooned by the higher centre console and enveloping dashboard, which chimes with the sporty intention hinted at by the car's name. Speaking of the centre console, as part of the facelift this has lost most of its physical climate controls in favour of the twin-touchcreen layout from the Velar. That means one 10.0in display for the infotainment and another 10.0in one below it through which you access the climate functions and driving modes. The screens look swish, thanks to well-defined graphics, and they're pretty responsive – not as snappy as the Q7’s system, but less laggy than the XC90’s can be. However, you can never learn touchscreen icons like you can physical buttons, which makes this system more distracting to use while you're driving than the Q7’s rotary dial controlled set-up. The omission of smartphone mirroring, via Apple CarPlay or Android Auto, will also annoy some. The fit of the panels and the operation of the switches aren't as exact as they are in the Q7, but the Sport looks, if anything, more special inside, thanks to its rich mix of leather and swish metal highlights adorning nearly every surface. And while it’s not as big inside as the XC90, it’s still more than roomy enough for most families. The P400e has a smaller boot than the regular Sport, though, due to a raised floor (to accommodate the batteries beneath), and it can't be had with a third row of fold-out seats. 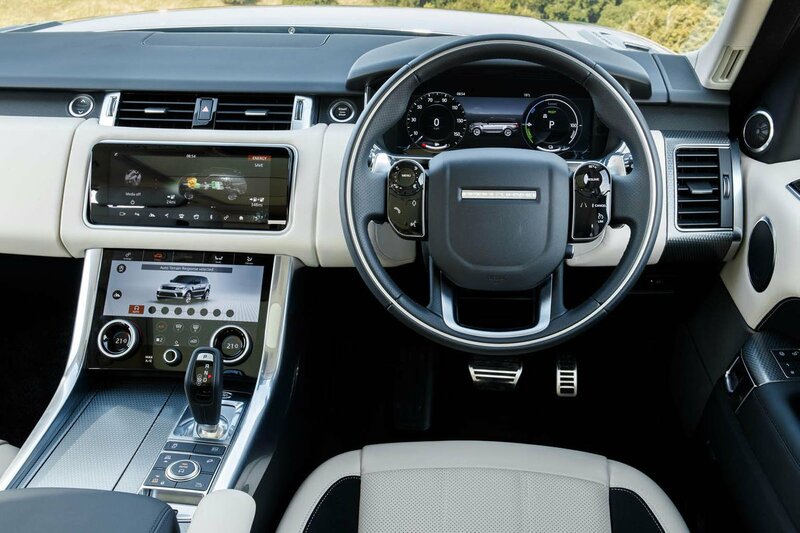 If you’d like to know even more detail about all aspects of the Range Rover Sport’s interior, click here to read our complete range review.